Even if you don't love fashion, odds are you're familiar with NYFW and friends. But you might be a little less familiar with Lakmé Fashion Week, India's biggest fashion event. Lakmé Fashion Week for summer 2015 just wrapped up in Mumbai, and whether you've heard of it before or not, one thing is for sure: There is SO much spring inspiration to be drawn from Lakmé's runways. Granted, the fashion event is aimed to highlight summer/resort collections for 2015, but whatever season you're planning outfits for, Lakmé Fashion Week is going to make you want more colors. Everywhere. ASAP. While there aren't a lot of options if you're more on the minimalist side of things, all of the looks from Lakmé Fashion Week are easy on the eyes to say the very least. Say what you will about bling and bright colors, but it's hard to dislike clothing that is so flat-out PRETTY. 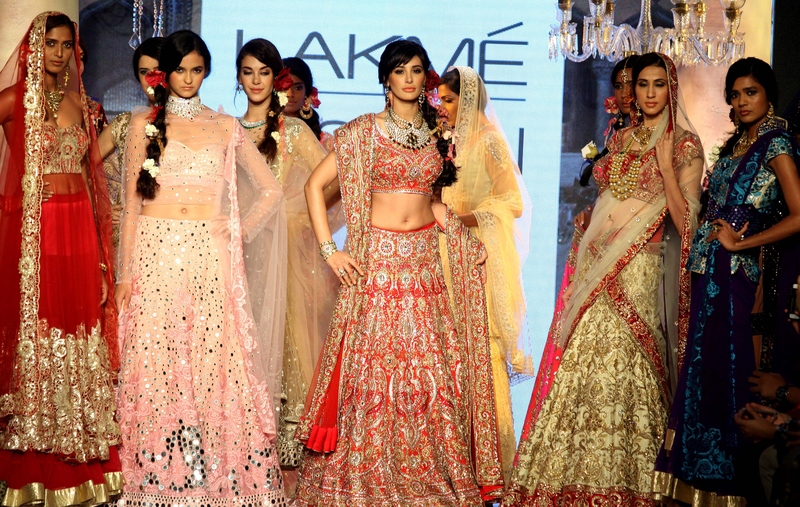 Another amazing feature of the runways of Lakmé? The models. They're not your typical, willowy NYFW models; many of them have bodies that look a little closer to yours or mine and it is SO refreshing. Whether you're looking for some fashion inspiration for the coming season or just curious to see what fashion week in another city is like, here are 11 of the best looks from Lakmé Fashion Week. But, really, how can you not love this? Like I said, aren't you ready to dress for spring now? There are SO many good things about this. So. MANY. A very spring-y Katniss, anyone? 8. This Makes Me Want A Tropical Drink? 9. This Makes Me Want Sorbet? A little metallic never hurt anyone. OK, one more accessory in general never hurt anyone. Ever.